Buying a new air conditioning and heating system? Are you ready to buy a new air conditioning and heating unit for your home, but not sure what you should pay or what you even need for that matter? The hard reality is, far too often homeowners are told that they need a new AC when in fact this is not always the case. Don't get me wrong, there is a place where it makes more sense to replace the air conditioner over repairing it. The tough decision for you is when should you buy a new AC. Air Conditioners tend to last around 10 years in Myrtle Beach with regular maintenance. Outside AC units along the coast last around 5-8 years. Heat pumps last slightly less because they work very hard in summer and the winter. After approximately 6-8 years it is common to see your air conditioners efficiency slide off a bit. This does not mean that it should be replaced but it does mean that the components of your AC are not working as well as they once did. Putting new parts in an old AC machine does not make the machine new. Okay, maybe that goes with out saying. Just don't expect a significant change in utility cost if you replace parts. Conversely, If you install a new air conditioning and heating system, your power bills will not change that much. The R factor and insulation will control your power consumption. If you do decide to upgrade your AC SEER be aware that you will not see a return on that extra investment for many years to come. Prices tend to rise during peak demand, so do air conditoner break downs, so waiting to replace your air conditioning system could cost you more due to demand. In years past, you could just go out and buy a heating and air conditioning system and have some guy put it in. Today, we all know that it's more complicated than that. With all the many components and options available, it is harder and more important than ever to be sure that you have just the right system. There are few items that a family will purchase that will be with them longer than a heating and air conditioning system. If you do decide to buy a new air conditioning unit, shop around. There are thousands of dollars difference between one HVAC Contractor and another for the exact same ac equipment and installation. If they will not quote you a new air conditioner price over the phone then there is a pretty good chance that they will charge you more than other will for a new hvac system. The best way to insure that your home will have a comfortable and healthy environment is to select a heating and air conditioning contractor with the knowledge, experience and resources to recommend the perfect system for your home. Having served the people of Horry and Georgetown counties for over 12 years, Hardings AC is your best choice. All systems include a 10 Year All Parts Warranty , 1 Year Labor Warranty and a 1 Year Complete System Maintenance (2 visits). This guide offers information and tips for purchasing a heat pump suited to your purposes. We discuss in detail the three key factors: Efficiency, performance and warranties. We'll also explain heat pumps and their purpose. Energy efficiency has never been more important to homeowners. Energy prices remain high and many consumers are committed to making ecofriendly choices. Heat pump efficiency is measured in two ways. Seasonal energy efficiency ratio (SEER) is how air conditioning efficiency is measured. Heating is measured by heating seasonal performance factor (HSPF). The warmer your climate is, the more efficient your heat pump should be. For example, in a hot climate like Myrtle Beach or Conway, you'll quickly make back the extra money you pay for an 18 or 20 SEER model versus a 14 SEER AC. However, if you choose the 14 SEER heat pump, you'll be paying higher utility bills than necessary for the next 20 years. Heat pumps are made in good/better/best performance: Single-stage, two-stage and modulating heat pumps. At present, not all brands make modulating models. Single-Stage Heat Pumps: These models are the least expensive, least efficient on the list of air conditioning equipment availble. They are chosen for their low cost and are really suitable for areas like ours,where gas heating is not required, and where cooling is a must. They are popular for use in economical residential installs and secondary locations like a vacation home or a guest apartment. Most are 13 SEER to 15 SEER models. 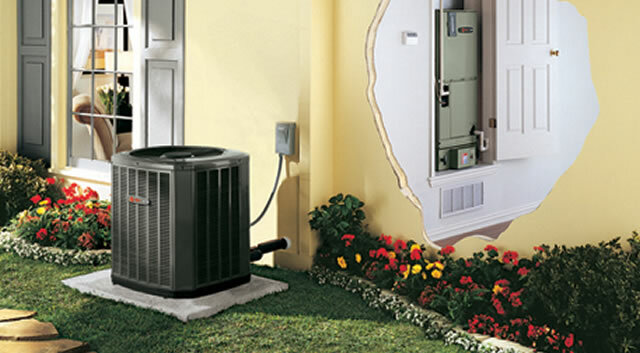 Single-stage heat pumps have a compressor that runs at full capacity all the time. They may produce temperature fluctuations of several degrees during heating or cooling cycles. Two-Stage Heat Pumps: These models have two-stage compressors. They run at low capacity, about 65% capacity, most of the time to maintain balanced heating or cooling. They run at full capacity to boost or lower temperatures rapidly. The reason they run on low capacity most of the time is to create gentler cycles and better temperature balance. During air conditioning cycles, the slower, longer cycles also remove more humidity than full-capacity cycles. Two-stage models range in SEER from 16 to 20. Modulating Heat Pumps: These models are also called variable-capacity heat pumps because their AC compressors operate at capacity between 40% and 100% depending on the heating or cooling requirements to keep temperatures evenly balanced. Think of it like cruise control on a vehicle. When set to 65 MPH, the vehicle's engine will work harder going uphill to maintain that speed and not as hard on level roads. A variable-capacity AC compressor will work just as necessary to keep your home's temperature right where you want it. These air conditioning models also do the best job lowering humidity in the warm months. Modulating heat pumps maintain temperatures within about one degree when working correctly. Only a handful of companies are making modulating heat pumps, and they range in efficiency from 20 SEER into the mid-20s. Your climate and budget are factors to consider when deciding on the performance you prefer.